Aeon is a registered charity committed to the spread of knowledge and a cosmopolitan worldview. Aeon is a registered charity committed to the spread of knowledge and a cosmopolitan worldview. Our mission is to create a sanctuary online for serious thinking. No ads, no paywall, no clickbait – just thought-provoking ideas from the world’s leading thinkers, free to all. But we can’t do it without you. This Email Newsletter Privacy Statement may change from time to time and was last revised 5 June, 2018. We will use the email address you provide to send you daily and/or weekly email (depending on your selection). We also send occasional donation requests and, no more than once a year, reader surveys. We are committed to ensuring that your information is secure. We have taken reasonable measures to protect information about you from loss, theft, misuse or unauthorised access, disclosure, alteration and destruction. No physical or electronic security system is impenetrable however and you should take your own precautions to protect the security of any personally identifiable information you transmit. We cannot guarantee that the personal information you supply will not be intercepted while transmitted to us or our marketing automation service Mailchimp. You may request a copy of the personal information we hold about you by submitting a written request to support@aeon.co We may only implement requests with respect to the personal information associated with the particular email address you use to send us the request. We will try and respond to your request as soon as reasonably practical. When you receive the information, if you think any of it is wrong or out of date, you can ask us to change or delete it for you. is deputy editor at Stanford Social Innovation Review. Previously, he was senior opinion editor at Al Jazeera America, and he has also written for The New York Times and USA Today, among many publications. He lives in Berkeley. Jones saw college as football and classes as an inconvenience. 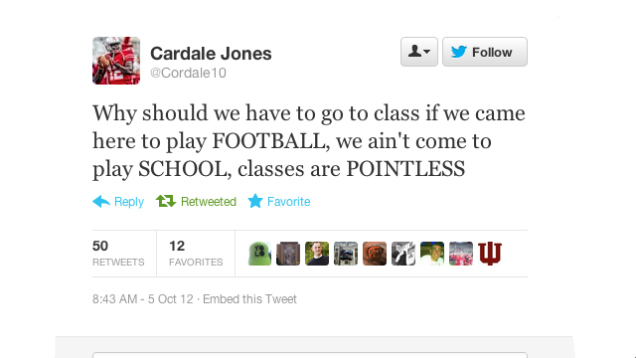 At the time, and again two years later when the quarterback led his team to a national championship, Jones’s tweet brought intense criticism. But maybe it shouldn’t have. College football players spend more than 40 hours per week on football, including time on the practice field, in the weight room, with trainers, and in film study and team meetings. On average, college athletes spend more than 30 hours a week on their sport. 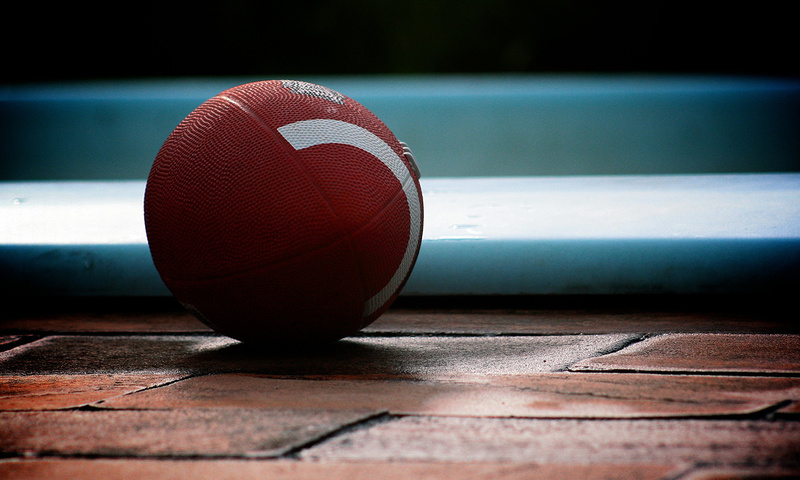 The US National Collegiate Athletic Association has a rule limiting college athletes to 20 hours per week, but it is rife with loopholes and a target of lawsuits. Such ambitious schedules leave college athletes exhausted and with little energy for coursework. In many cases, the primary reason they are attending college in the first place is to play a sport. Many athletes evince a dedication exceeding all but the most committed students of the sciences or humanities. In fact, the phrase ‘student athlete’ is redundant. To be an athlete is to be the student of a discipline as rigorous and as noble as literature, chemistry or philosophy. The ancient Greeks, who invented the idea and practice of the academy, conceived of athletics as a basic component of education and culture (paideia). Ancient precedents aside, any college course catalogue today reveals many majors focused primarily on a physical or practical, rather than theoretical, field of study. The University of California, Berkeley, my alma mater, supports majors in art practice, dance and performance studies, theatre and performance studies, music, film, creative writing, journalism, communications, and business administration. The art practice major consists ‘largely of studio courses’ and focuses on artistic production, although students also take classes in art history, theory and business. All of these majors combine educational requirements of practice and theory, but focus on practice. They provide an obvious model for majors in sport. The football major, for example, would consist of the practicum, the many hours of physical training, practice, film study and meetings. Courses would also be required in the history, science, criticism and business of the discipline, as well as in the related fields of physiology, nutrition, journalism and sports management. Indeed, all of these fields of study already exist. A graduate of the football major could claim some expertise in the field, and be someone with the potential for significant impact, as an athlete, coach, trainer, agent, commentator, consultant, or team member in a complex organisation. Some critics might argue that sport is not intellectual enough to be enshrined as a field of academic study. But this objection presumes a much too restricted view of intellect, a proper account of which must also clearly make room for performative activities such as art, theatre and dance. Thanks to recent scientific and academic research, we have a much better appreciation of the intelligence required for athletic excellence. Sport intelligence requires cognitive performance that is extremely demanding: the ability to read the complexity of a situation, to come to near-instantaneous intuitive judgments about how to react, and to move the body accordingly. It requires, as the journalist Chuck Squatriglia explained about soccer research in Wired, ‘what neuropsychologists call executive functions, which include the ability to be immediately creative, see new solutions and quickly change tactics’. In developing a game plan, coaches typically break down everything that happened in the opponent’s past four games to granular levels of ‘tendencies’ – down, distance (to a first down), field position, and time remaining on the game clock. Once assembled, this research fills many pages of the game-plan binders players are given on Wednesday to prepare them for Sunday. (Teams have also begun to use iPads.) The binders are dense with intricate drawings and written instructions. They are often as thick as a left tackle’s fist. What players learn is then tested under high-stress real-world conditions, in practice and actual games. How many fields of study can say the same? I would also argue that people suffer from an impoverished view of the human mind. The popular tendency is to think of consciousness as something that happens inside the head or the brain, but philosophers are challenging this view with an approach that sees the mind as the interaction of one’s entire neurological system with the environment. The US philosopher Alva Noë, for example, who has written several books exploring a new theory of mind, appeals to practices such as dance, which demonstrate how mental activities can be bodily and spatio-temporally extended, coordinated and social, and both reactive to and manipulative of other people and the world. And psychologists such as Howard Gardner have theorised that kinaesthetic intelligence, the ability to use the body to solve problems, is a distinct form of intelligence worth study. While these distinctions might be unfamiliar to many, people do seem to recognise the unique intelligence of athletes and how that intelligence can translate into other domains. Businesses, law firms and other complex organisations requiring a sophisticated balance of competition and cooperation often recruit from college athletics, especially from team sports. Creating sports majors also addresses real problems. Unlike philosophy or anthropology, sport is a booming multi-billion dollar industry in the United States and around the world. It offers potential for employment in an extensive variety of fields: coaching (high school, college, pro), physical training, marketing, law, consulting, design, management, and more. Sports majors would help athletes to succeed in these fields. If Cardale Jones, for example, does not make it in the National Football League, his next-best options might be as a football coach, trainer, agent or businessman. For at least a century, US universities have decided to include athletics in higher education, and that is not going to change. Nor should it. We just haven’t pursued the logic to its proper end. It is time to make football a major.